This year in March, the EU celebrates the 60th anniversary of its founding Treaties of Rome. But it is also faced with enormous challenges, not least the rise of right-wing populist parties and politics hostile to its structure and fundamental democratic values. Several national elections in 2017 will be crucial for the future of Europe. After the dramatic Brexit referendum and the Austrian presidential race in 2016, it is the turn of the Dutch to make their voices heard (15 March). On 23 April/7 May, the French will follow. On 24 September, the Germans go to the polls. 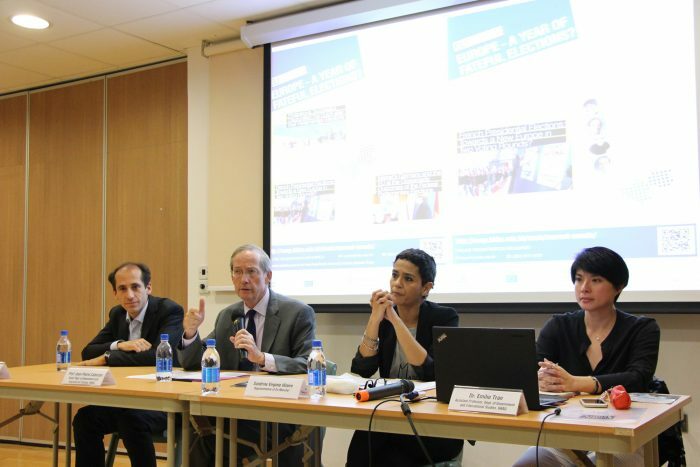 The EUAP will follow the elections and their outcomes with a series of public debates about their respective political, economic and social backgrounds – and their consequences for the entire ‘European Project’. Dr. Emilie Tran joined Hong Kong Baptist University in August 2016, as Assistant Professor and Course Coordinator for the European Studies programme (French Stream) in the Department of Government and International Studies. She teaches POLS2205 European Politics and Society: French Political and Government System; EURO2005 Contemporary European Societies I: The French-Speaking Countries; EURO4015 Contemporary European Societies II: questions d’actualité; and EURO4006 European Economic and Business Life: travailler en contexte international. Sandrine Virginie was attorney-at-law in France before coming to Hong Kong two years ago during which she has worked for various NGOs. She is since one year back to legal affairs and is currently Managing Director of a consulting firm specialised in intellectual property. She engaged with the Movement En Marche! 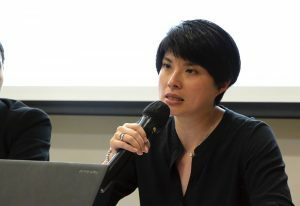 last year and is co-managing the Hong Kong Committee and spokeswoman of En Marche! in China and Hong Kong. En Marche! is the political movement created and launched by Emmanuel Macron, former Minister of Economics and currently candidate for the upcoming French Presidential race. Antoine Freches started his career in banking in 2004. 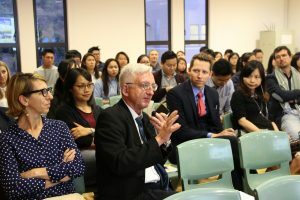 After some short working experiences in Paris and Singapore, he settled down in Hong Kong in 2006, where he is currently working for a financial services company. He is coordinating the support group for Francois Fillon in Hong Kong for the 2017 French presidential elections. Antoine graduated from HEC Paris with a Masters in Science of Management. Several national elections in 2017 are likely to have profound impact on the future direction of Europe and the way EU Member States will respond to current challenges. In March, Dutch voters were the first to take to the polls. 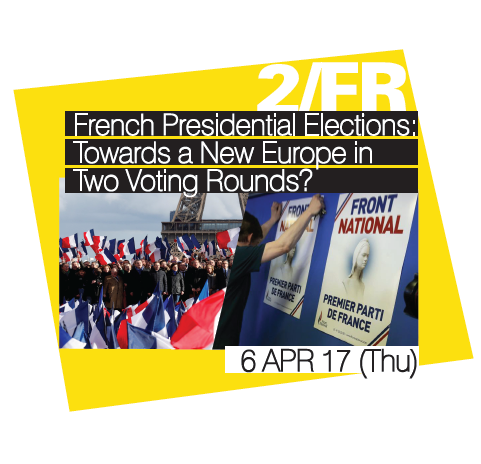 The next will be the French who will elect their new president on 23 April/ 7 May. The seminar held by the EUAP on the 6th of April aimed to take a closer look at French presidential candidates, discuss their programmes and possible electoral outcomes. The elections will be of high importance not only for France, but also for Europe in the context of Brexit, the victory of Donald Trump in the United States, and right-wing populist sentiments. According to opinion polls, there are currently two leading candidates going head to head in the race – socially liberal centrist Emmanuel Macron and far-right Marine Le Pen. They are followed by far-left candidate Jean-Luc Mélenchon, and François Fillon with centre-right conservative agenda. If there is no winner gaining more than 50% of votes in the first round of the elections, there would be a second round for two main contenders. At the moment, polls predict the victory of Emmanuel Macron if he and Marine Le Pen face each other in the runoff. 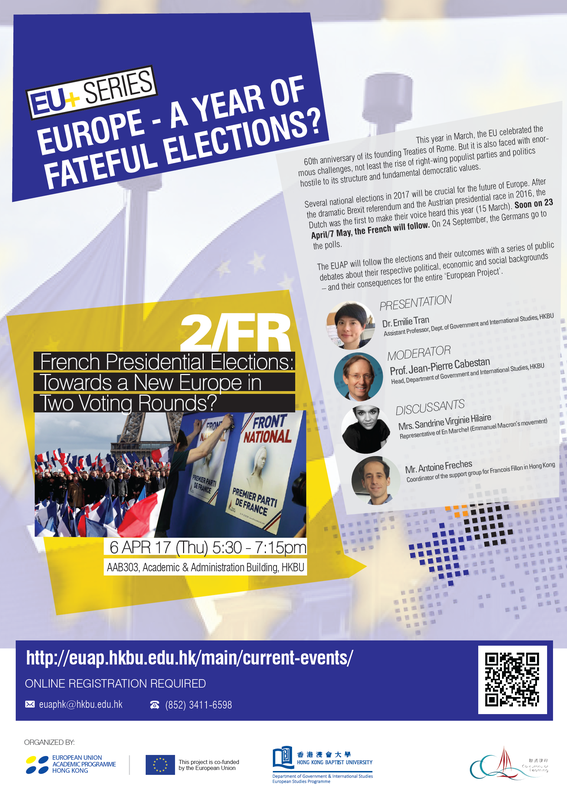 Dr. Emilie Tran stressed that the upcoming elections are unusual for France, since for the first time the incumbent president is not running for the second term in office, likely due to high public dissatisfaction with his governance. So unusual are the presidential contenders, for instance, Socialist party candidate Benoit Hamon who struggled to win support of divided fellow party members, François Fillon who is currently under investigation for misuse of public funds, and Emmanuel Macron who, if elected, would become the youngest-ever French president with little political experience. Moreover, this time candidates’ positions on topics such as European integration, environment and institutions do not follow traditional left-wing/right-wing divide. For instance, Emmanuel Macron is the only candidate who strongly advocates unity and closer cooperation within the EU. The discussants agreed that economic situation in France appears to be a particularly important issue for the French electorate, as around 25% of young people struggle with unemployment. Protectionist programme and anti-globalization rhetoric of Marine Le Pen is therefore especially appealing to young, unemployed and uneducated part of the society. François Fillon who can count on support of older voters and retirees, wants to deregulate the labour market, making it more flexible for companies to hire employees, and cut down on public spending by reducing the number of civil servants. He is also looking for rapprochement with Russia. Emmanuel Macron and his young “En Marche!” movement are aiming to cut taxes, give companies incentives to invest and build on advantages of being a part of the European Union. An important note in the discussion was that the elections outcome remains hard to predict due to foreseen high abstention rate and high number of undecided voters. The discussants touched upon François Fillon’s decline in the polls and who his electorate is likely to back up in the second round in case of his defeat. It was also emphasized that at the end newly elected president may not meet with support of majority of the Parliament members after the June parliamentary elections in France and he/she will have to seek for alliances across broad political spectrum.